University of Missouri players organized and threatened to boycott the remainder of the season’s games. The protest forced the resignation of Mizzou President Tim Wolfe, amid allegations of ignoring racism problems on campus. The successful protest demonstrates how much our country, college football, and universities have changed over the past decades. Student-athletes, like many young people, have a tradition of standing up for what they believe in. The Mizzou situation reminded me of a story Conrad Dobler shared with The Game before the Money. Dobler played for the University of Wyoming. The Cowboys (and this may surprise you) enjoyed a recent Sugar Bowl berth in 1968, under coach Lloyd Eaton. The unbeaten, fifth-ranked Cowboys fell to LSU 20-13, but the appearance helped in recruiting. Even Dobler decided, “Hey, why not play for the winning team?” when offered other WAC scholarships in addition to Wyoming’s offer. 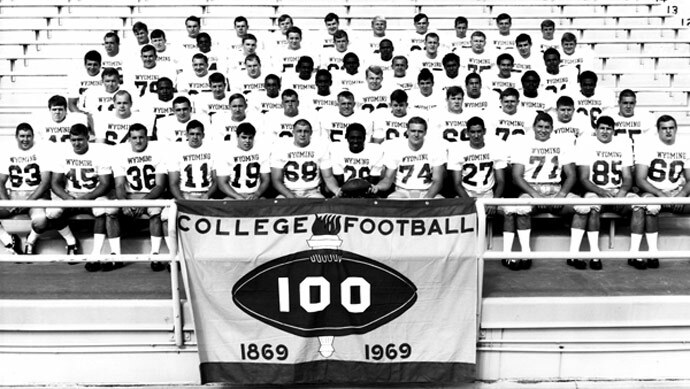 1969 stood as college football’s 100th anniversary, honoring the 1869 Princeton/Rutgers matchup that’s widely accepted as the first college football game. Wyoming’s African-American athletes had one game circled on their schedule that year, the game against Brigham Young University. “The blacks on the team wanted to wear black arm bands during the game to protest the Mormon religion’s policy of not allowing blacks into their ministry,” Dobler told The Game before the Money. The fourteen players wore black arm bands to practice. Eaton kicked them all off the team, leaving his squad shorthanded. “We had to dress a cheerleader because he could snap long,” Dobler amusingly remembered. The press dubbed the situation as, “The Black Fourteen Incident.” San Jose State players wore arm bands to honor the protesting Wyoming players in their game against Wyoming. The incident ruined Eaton’s program, as recruiting really suffered afterward. He soon lost his job and was replaced by Fritz Shurmur. A photo of ten members of the “Black Fourteen” appeared in Sports Illustrated. Missouri’s reaction underscores the changes our society experienced since “The Black Fourteen Incident.” Whereas the Wyoming players were kicked off the team, the Missouri players were backed by their coach, and the university stated that student athletes had a constitutional right to organize. The solidarity forced the president’s resignation, rather than the coach forcing the players’ resignation. In a day where it’s clear our country has a long way to go in these issues, it’s important to look back and see how much has changed. The entire Missouri team will now suit up on Saturday, coincidentally against the BYU Cougars. READ STORIES OF 40 NFL LEGENDS, INCLUDING CONRAD DOBLER IN THE GAME BEFORE THE MONEY.